Indonesian intransigence means other ASEAN countries’ citizens will have to put up with forest fire haze for another year. That eye-tingling, gut retching annual show is back. ‘The Haze’ is playing across the region to hapless audiences and rudderless governments who promise much and deliver little. 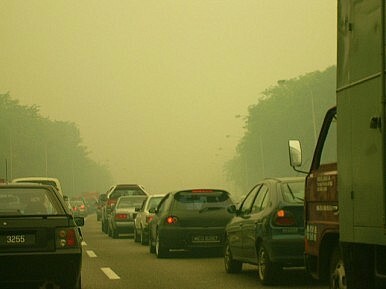 Forest and peat fires and burning off by farmers in Indonesia have sent pollution in Singapore and much of Malaysia to health-threatening levels—far outdoing what the eruption of Mount Merapi was able to. Peat fires alone can burn for months and continue burning underground, even after the surface blaze is extinguished by heavy rains. South-east Asia is full of the stuff, with 24 million hectares of peat, 70 percent of which is in Indonesia. Singaporeans are again rather annoyed that their well-scrubbed image has been tarnished, while in Malaysia, the government has ordered masks for school children. But in Jakarta, the haze barely rates a mention as prevailing winds ensure the capital is rarely touched by that type of smog. This year’s haze has anyway arrived later than usual, with the monsoon season meaning any damage and the associated whinging will be limited compared to previous years. Nevertheless, the non-dabbling foreign policies of Singapore and Malaysia and the rest of ASEAN will guarantee the annual choke again denies their citizens their right to clean air. ASEAN adopted an agreement on cross-border haze pollution in 2002 to help co-ordinate efforts in fighting fires caused by slash and burn practices among farmers and massive land clearing for products like palm oil by large companies. A separate regional action plan to combat the haze—a peat land management strategy and a panel of experts assembled to assess and coordinate fire causing haze—have all been negotiated within the ASEAN framework. But a slight problem exists. The treaty cannot be implemented because Indonesia has failed to ratify it, and no one seems to think they will anytime soon. As one analyst recently noted, the bloc hasn’t even drawn up an implementing mechanism that will allow the treaty to work. ASEAN foreign policies, big business interests and unwitting farmers will ensure encores are performed by ‘The Haze’ for many years to come. No doubt there’ll be hardly a dry eye in the place, with choked-up audiences paying tribute to cross-border relations in South-east Asia.